Here's the latest in my Jenna book. This will be the first page - when they met. Click to enlarge if you like. PolkaDots & Stripes lynnegrievesonuk@yahoo.co.uk; HappyFrame http://tracireed.com/teamblog; Mittens & Holders http://digitreats.typepad.com; StampFrames & Binder http://www.storeide.se/gunhild/index.htm. We all get lots of twister ties from products we buy, bread, electronics, etc. Instead of throwing them out, collect them neatly like this and put them in your utility drawer for the next time you need one. They extra long ones are golden - take good care of them! Next time you need to close something just pull one out; they come out easily. Use them to close a bag; loosely attach a vine to it's supports; group computer cables together so they don't look so messy, don't go buy something special just for that - use your twister ties! I don't save the paper ones as the plastic hold up better for reuse and there are plenty of them. The total cost was $0 and time spent was 0 minutes - no trip to the store! And how is this inspirational? We are to be good stewards of all God gives us! This is not only saving money, but recycling! Praise the Lord in ALL THINGS! If you'd like more of these, let me know and have a super day! 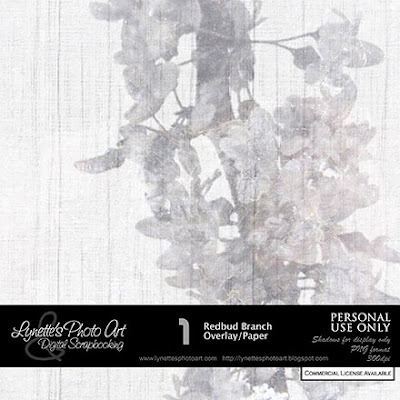 Today's freebie is a RedBud Branch Paper that can also be used as an overlay. Lovely paper, thanks so much! Thank you so much for this Freebie. I want to let you know that I posted a link to your blog in Creative Busy Hands Scrapbook Freebies Search List, under the Page 1 post on Aug. 21, 2009. Thanks again. Thank you very much for the dragon-fly ! It's years last time i saw one unhappily. I've just try the "lichen" 4Shared link, it says "required link not valid".